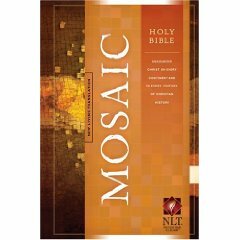 Holy Bible Mosaic released today. Back in June, I wrote about the upcoming project Holy Bible Mosaic from Tyndale House due out in the fall of 2009. Well, it's here. And the NLT Blog is celebrating with a release party. Check it out. You can enter to win a free deluxe edition Holy Bible Mosaic and up to a $500.00 Amazon gift certificate. If you're a facebooker, all you have to do to enter is become a fan on facebook. Bloggers can blog about it. And Twitterers can tweet about it. This is really a great giveaway. Don't miss your chance to win the deluxe edition Mosaic. Buy Mosaic from Amazon at the BOB Bookstore.